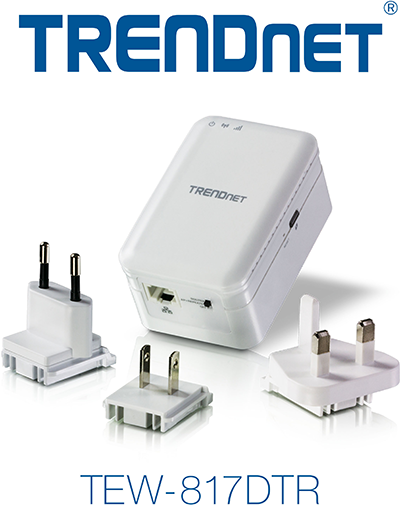 TORRANCE, Calif. – Jan. 6, 2015 – TRENDnet, a best-in-class wired and wireless networking hardware brand, today announces the AC750 Wireless Travel Router, model TEW-817DTR-the first WiFi AC travel router with interchangeable power plugs which ensures operability on every continent. TRENDnet’s AC750 Wireless Travel Router, model TEW-817DTR, is a powerful travel router with concurrent 433 Mbps WiFi AC and 300 Mbps WiFi N bands, for on the go professionals. Users quickly convert a single wired or wireless internet connection into a shared WiFi network for all Wireless AC and Wireless N devices. The compact TEW-817DTR plugs directly into a power outlet and is held off the ground by the outlet. Swappable North American, European, and United Kingdom power plugs ensure the travel router will work on every continent.